HMS Liverpool has stopped a suspect car ferry entering Libya as part of the Nato arms blockade, the Ministry of Defence said. The Portsmouth-based destroyer leapt into action to board the roll-on, roll-off ferry Setubal Express, which was sailing from Malta toward the Libyan capital Tripoli with a cargo of vehicles. The crew suspected cargo was onboard which could be used by forces loyal to Colonel Gaddafi. 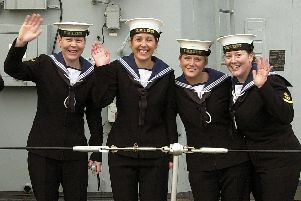 Liverpool sailors boarded the ferry and discovered the ship’s cargo record book ‘contained irregularities’, the MoD said. As a result, the vessel was ordered not to enter Libyan territorial waters and to redirect to Salerno, Italy. Liverpool also controlled aircraft over Libya this week. The ship’s fighter controllers worked with coalition F18 fighter jets, tanker support aircraft and maritime patrol aircraft to ensure the continuity of the no-fly zone. HMS Liverpool left Portsmouth at the end of March to relieve the Type 22 frigate HMS Cumberland, which was due to return home to Plymouth today after rescuing hundreds of people from the war-torn country and helping to set up the no-fly zone last month.